"She liked giving people things," Elwood said of Flossie. Over the course of Flossie's career, she used her talent and love for education to teach elementary schoolchildren for decades. Flossie taught in many states all across the country, from California to Virginia. Elwood came into Flossie's life in the 1970s. When Flossie first met Elwood, he was just a family friend. "Of course," Elwood said, "our friendship blossomed." Elwood's tenured position in food science and nutrition brought Flossie to the University of Minnesota. Continuing her love for education long after she retired from teaching, Flossie was instrumental in the revival and revitalization of the University of Minnesota Women's Club (UMWC). "The Women's Club was a failing organization," Elwood said. "But Flossie could see it had potential." Previous policies for the club excluded any woman who did not have a husband who was a tenured professor. "Flossie was largely responsible for reorganizing the bylaws to welcoming anyone in the community, whether they had a faculty connection or not." As the feature obituary in UMWC's newsletter about Flossie said, "It is fair to say that this significant change is responsible for the continued vitality of the University of Minnesota Women's Club today... Flossie will live on in the hearts of all who knew her and in the good works of the UMWC." 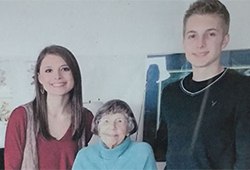 Flossie's genuine interest in helping people succeed, combined with her husband's study of food and nutrition at the U, brought Flossie to think of Second Harvest Heartland in her planned giving. "It well-represented her interests during her lifetime," Elwood said of her gift. "[We had] an interest in saving foods that you can't sell anymore but are perfectly good nutrition for people who need them." Another one of Flossie's interests was watercolor painting. Flossie lived a truly beautiful life, painting countless landscape scenes from the many places she had the joy of visiting with Elwood in their 36 years together. "She was always interested in nature," Elwood said. The nature scenes depicted in her paintings were stunning, and she wrote candid and friendly descriptions for each artwork. The senior living complex Elwood and Flossie lived in towards the end of Flossie's life decorated the whole seventh floor, where their apartment was, with dozens of paintings by Flossie. "She did sell quite a few, but she didn't like that," Elwood said. She always liked giving them away instead. Planned giving is one of the best ways to support Second Harvest Heartland's work. When you plan a gift to Second Harvest Heartland in your estate, your generosity helps end hunger in years to come. With Flossie's gift upon her passing, she helped provide 60,000 meals to our neighbors. "It's no compensation for losing her," Elwood said, "but it's a comfort to know we can do the things she would have done."